Barska Spotting Scopes come complete with 20 to 60 power zoom lens and bench/tabletop tripod in a protective molded carrying case. Barska Scopes are perfect when you need the extra zoom power. Barska Benchmark spotting scopes are a diverse line of very affordable scope kits for beginners! Benchmark scopes feature nitrogen-purged, waterproof, fully-coated optics with adjustable zoom eyepieces, compact panhead tripods, ACCU grip handheld mount and a carrying case. Backed by a limited lifetime warranty. 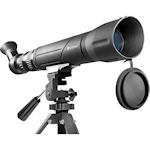 Barska Blackhawk spotting scopes are a complete line compact to large spotting scope kits priced very affordably for beginners or as a spare scope. Ranging from 50mm to 100mm objective sizes, Blackhawk scopes feature zoom eyepieces in 18-36x, 20-60x, and 25-75x models. 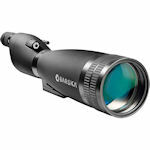 Barska Gladiator spotting scopes are large objective scope kits with 100% waterproof, nitrogen-purged optics. Each scope kit includes Micro adjustable tripod or and carrying case. Durable rubber armoring protects the optics on Gladiator spotting scopes. 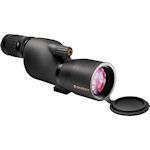 Barska Level Spotting Scopes are inexpensive but have features lacking on many of their competitors. They are waterproof and nitrogen purged. The optics are fully multi-coated with BaK-4 prisms. All kits include table-top tripod, soft and hard cases. Barska Naturescape spotting scopes are a diverse line of straight configuration scopes offered in kits with cases and tripods. 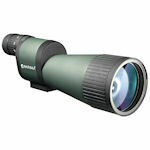 Available in 50-, 60-, 65- and 80-mm objective sizes, Naturescape sopes all have zoom eyepieces. Two models are made with BK-7 glass prisms; the ED versions feature BaK-4 glass and fully multi-coated optics. 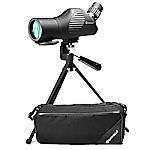 The Barska Spotter-Pro 80 is a full-sized spotting scope with a 22-66x zoom and an 80-mm objective lens. Spotter-Pro scopes are compact and portable, waterproof, and made with multi-coated optics. Extra long eye relief and an extensible sunshade completes the package. 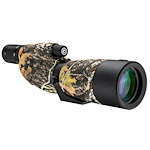 Spotter-Pro scopes come with black or camo armoring. 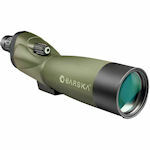 Barska Spotter SV spotting scopes are affordable scopes with fully coated optics in an angled eyepiece configuration. The SV stands for "Super Value" as these scope kits include a tripod, lens cloth, case and rotating eyepiece. Spotter SV scopes are available in 15-45x50 and 20-60x60 versions. 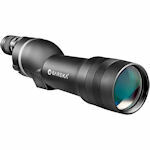 Barska Tactical Spotting Scopes feature BK-7 prisms, fully multi-coated prisms and a side focusing system.